Cone Beam Imaging is a medical imaging technique that appeared in the late 1990s. This technique makes it possible to carry out 3-D radiological examinations. Compared to the usual scanning methods, this technique allows radiography of the whole area to be performed in a single pass, giving a 3-D model at the end of the procedure. The images are available to the dental surgeon very quickly as they are sent using a computerised method: (iPad, computer). These high-resolution images make it possible to communicate directly and easily with the patient. 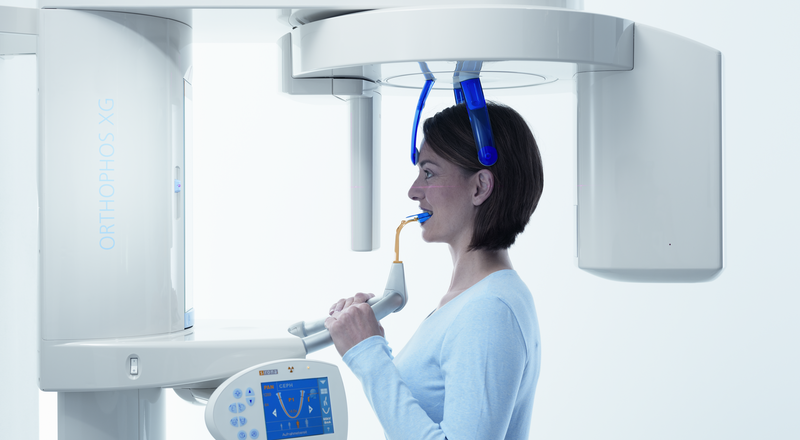 Cone Beam Imaging is very widely used for dental examinations and for examination of the sinuses, maxillofacial bone structures and some joints. Cone Beam Imaging is recommended in the case of infections, fractures, cysts, dental implants, impacted teeth and bone lesions. It makes it possible to determine the volume of bone available for the insertion of dental implants and to choose the most appropriate implant size and shape as a function of the patient’s morphology. • Cone Beam Imaging is very useful for carrying out simulations and modelling bone grafts for dental implants. • 3-D simulation of implant placement. • Makes it possible to see non-visible tooth infections. • Provides information about the small bone structures. • Uses less X-rays than a scanner. • No side effects and no risks. The dental examination proceeds in the same way as a general dental examination. A disposable plastic piece is inserted between your teeth. You will have to remain motionless for 10 to 20 seconds. All metal objects must be removed. If you are pregnant, let your dentist know so that the necessary precautions can be taken. The radiographed zone is then sent digitally to the dentist who analyses and interprets the collected data, after which a report is written.